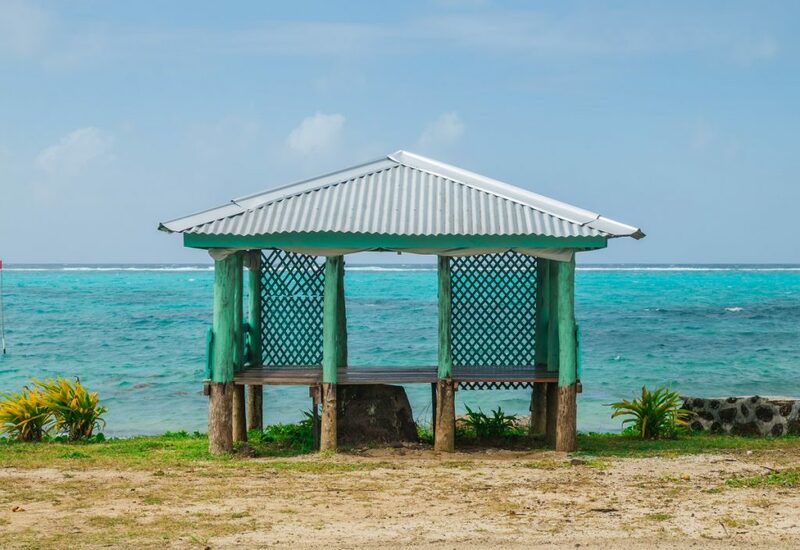 When traveling in New Zealand, we met a woman who raved about Samoa. 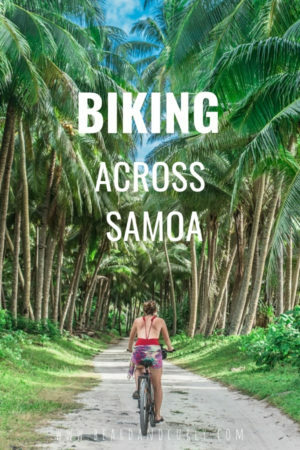 She had been to Samoa before and mentioned that she biked around the entire island of Savaii. By the look of Yana’s face, I already knew I was in for a week of biking. We figured it would be a nice change of pace from getting around by bus. Biking across Samoa would allow us more freedom and we could cruise the island at a leisurely pace. With 90% humidity and scorching heat by 9 am, I think we overestimated ourselves. But was it worth it? Hell yes!!! Our first day biking started mid-day. It felt like we lost 5 pounds just in perspiration alone. Luckily this is Samoa and meals are enormous. The second day got better. The scenery was nice, the ride was flat, and we cruised into Manase before lunchtime for a 2-day stay. Our third day biking was the real knee wrencher, literally. Yana’s knee was bothering her the second half of the day. It was 90 degrees and humid. Although Yana hates to admit it, no matter how little I work out, I seem to be cruising right by her. This might be why she got mad at me for no reason and we got into a fight. Maybe it was the heat. Maybe the knee. Just a few miles later, ice cream seemed to solve both our marital and her knee problems. We pushed on. A day off at Falealupo was a perfect rest from the longest biking day. We enjoyed Savaii’s best beach with our new Aussie honeymooner friends Tom and Mindy! By now we were in a groove and biking seemed easy. A scenic ride down the South Coast, rock arches, some of the best snorkeling we have ever done, massive blowholes and a relaxing waterfall to swim in closed out a perfect week on Savaii. Now that Yana’s knee is better and I make sure she has enough ice cream, we can both agree on how much fun our week in Savaii was. 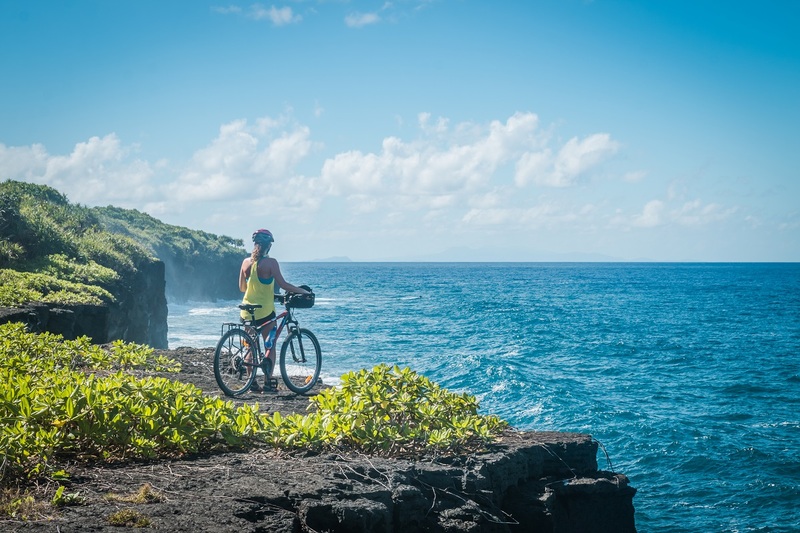 The shoulder season between May and September is the best time to visit Samoa, especially when planning to cycle. The weather is better, but be ready for hot days and nearly 100% humidity. Always bring extra clothes and quick-dry is the way to go! There are two ferries between Upolu and Savaii. The Lady Samoa 3 is the larger ferry (smoother ride and quicker) and runs two to three times per day. The Samoa Express runs less frequently Monday through Saturday. Times start from 6am departing Salelologa (Savaii) and 8 am departures from Mulafinua (Upolu), however, the schedule changes each month. The cost for the ferry is 12 Tala per person. The bike is an additional 10 Tala. Getting from Apia to Mulafinua is one hour by bus (4 Tala) or by taxi (60 Tala). Check out ferry schedules here. 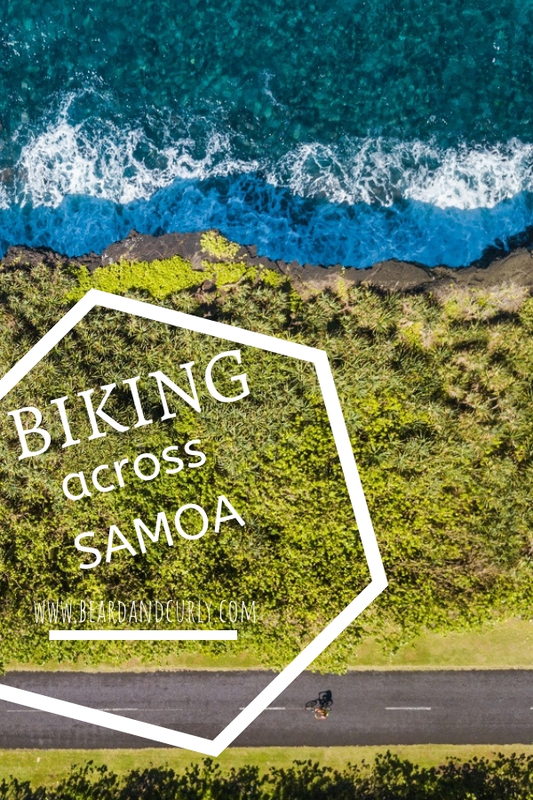 Outdoor Samoa is next to the Airport Lodge, located 3km past Mulifanua Wharf. 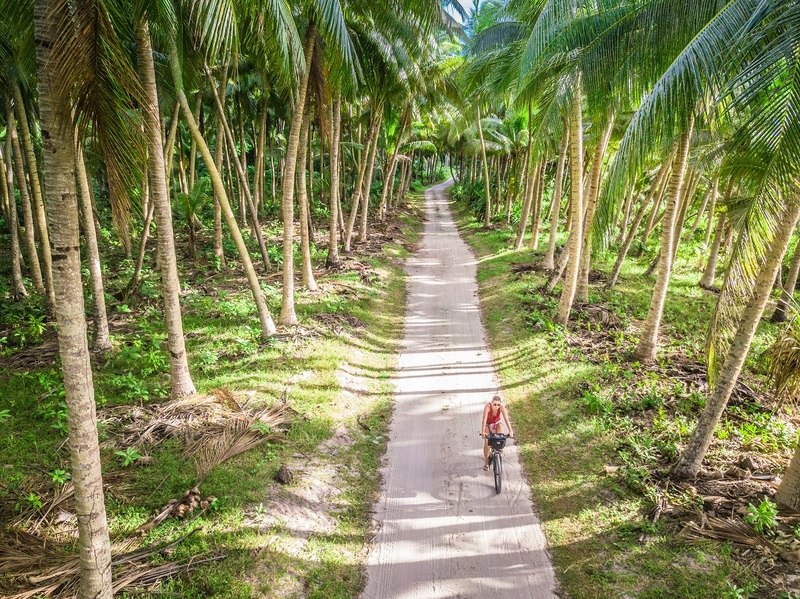 Owned by a super friendly and energetic couple from New Zealand, Ross and Frances are very helpful in arranging tours and self-guided trips in Savaii and Upolu. The bikes are very good quality and relatively new. The cost for a mountain bike rental is 65 Tala per day or 280 Tala per week. Bike rentals come with a good-sized handlebar bag for valuables, pump, spare tube, tool kit, lock, and helmet. Rental of panniers, child bikes, kiddy seats, snorkel gear and kayaks (for tours or Manono Island trips) are available for extra costs. *Time only includes actual bike time, not including any breaks longer than 5 minutes or stops at any activities. The first day was an easy and flat ride, although arriving mid-day in the heat was a little unbearable at times. The first half of the ride was busy with cars. Most of the day we passed through small villages with children yelling “bye-bye” until reaching our first stop, Lano. Stay: Lauiula Beach Fales has several beach fales with excellent dinner and breakfast included, managed by a very adorable Croatian couple. 60 Tala per person. The road opens up and there is much less traffic. There are a few hills. Most of this biking day was inland. We made one stop at the Sale’aula Lava Fields and the Lava Church (5 Tala pp). 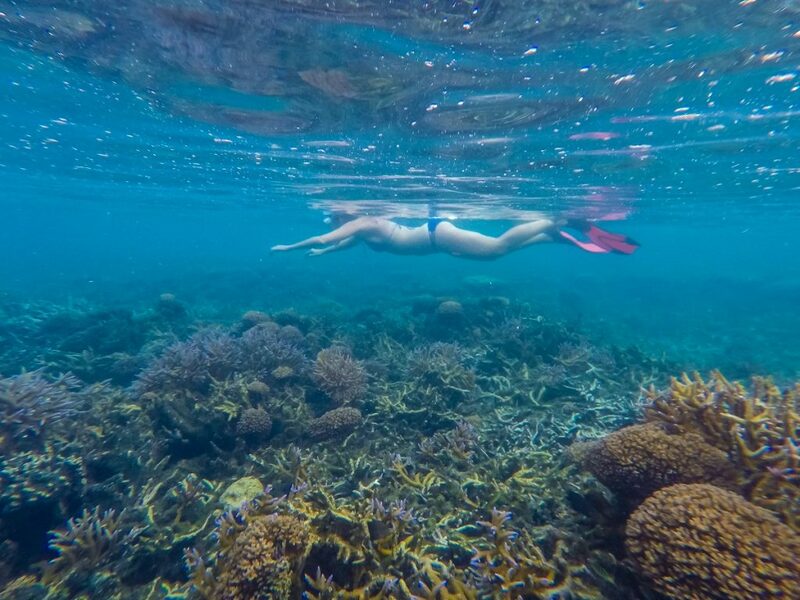 Swimming with Turtles is nearby in Fagamalo, however, we do not recommend this. This sanctuary keeps the turtles in a large cage in a murky lagoon. They allow people to touch and even pick up the turtles. It is best to see these beautiful creatures in their natural environment. Vacations –nice main eating area, OK fales with chairs out front, retention wall with no beach. Breakfast and dinner included. Mid-sized with ~15 fales. Sunday Umu is available. Stated the price is 90 Tala pp, but quickly went down to 70 Tala saying it was a discount. Janes –The most run down of the fales, but the nicest beach, enclosed fales and large grounds with 20+ fales. Breakfast and dinner included. 70 Tala pp, but will go down to 55 Tala. Stevenson’s – resort with AC rooms and luxury beach fales. Swimming pool and beach bar. Beach fales are 220 Tala for the entire fale, breakfast included. Day use of pool facilities are available for 20 Tala, or 10 Tala with lunch. 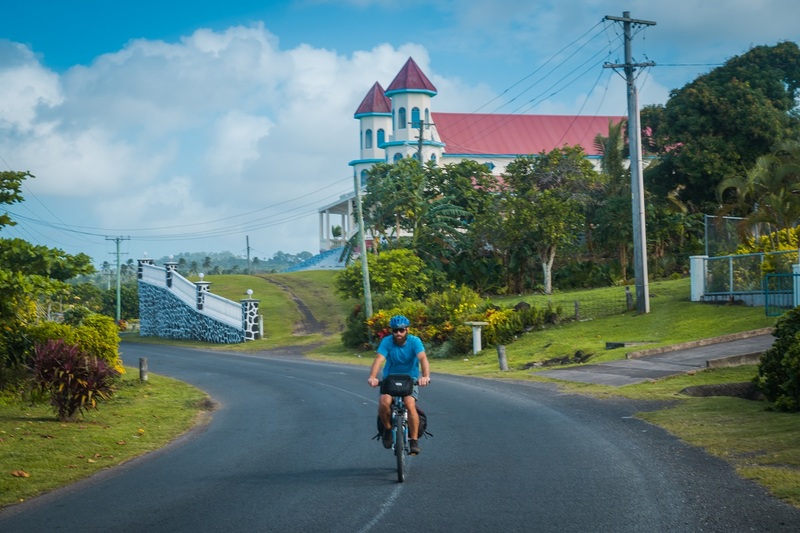 The north coast of Savaii is a long stretch with hills and some tough inclines. There are only a few small villages between Samauga and Asau, so be sure to stock up on water. The road is inland until getting to Vaisala Bay, a scenic bay with beautiful turquoise water. This was a perfect place for a snack and rest. It is a good option to stay the evening, but we continued to Falealupo. There were a few more inclines before reaching a big convenience store. A perfect stop for ice cream. It also was a perfect stop for Yana’s knee and a marriage consultation with some completely unnatural looking yellow ice cream. It was delicious. 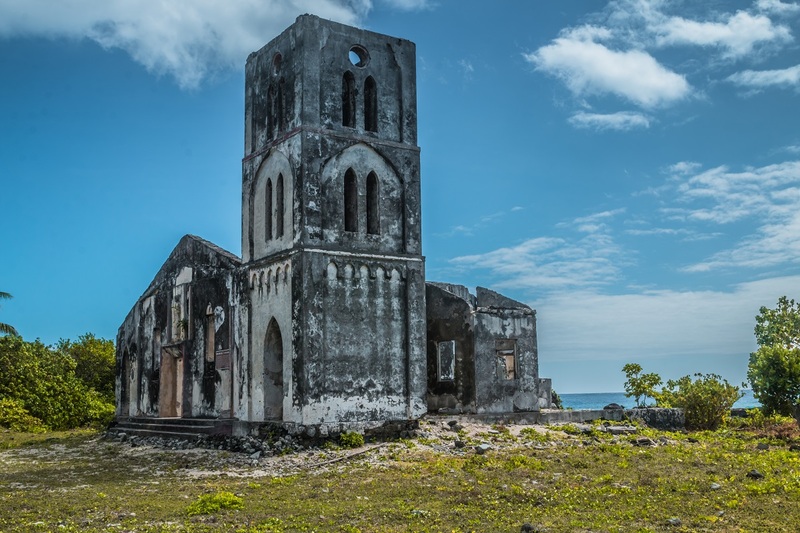 Shortly after, the road to Falealupo descended to the Northwestern most point of the island. The last few kilometers is on a sand/gravel road. The long day was worth the extra effort to have an off day at Falealupo. This was by far the best beach in Savaii and had great snorkeling. 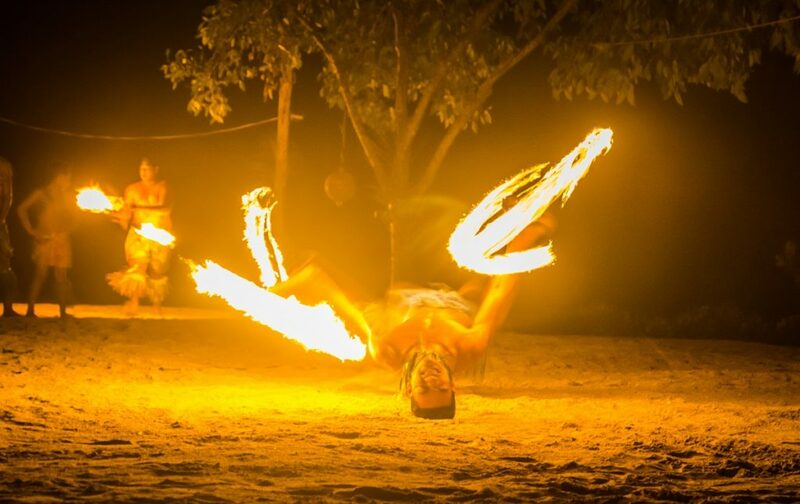 Stay: Falealupo Beach Fales for 70 Tala pp, breakfast and dinner included. **This is the longest and hardest day. For a shorter day, stop at Vaisala Beach Resort for 120 Tala for an AC room. Can visit the Canopy Walk ($20 Tala), the House of Rock, the ancient star Mound or the Mago Cave. Based on pictures and feedback from a few people who went, we do not recommend these places. Instead, enjoy Savaii’s best beach. From Falealupo, there was a beautiful palm tree lined road. We had a lot of incline to get back to the paved road. From there, we headed south to Satuiatua. The road descended to Falelima where there is a rocky shoreline and a beautiful Sea Arch. This was some of the most scenic coastline in Savaii. There was another big climb up through small villages where there are cliffs, including the landmark Lovers Leap ($2 Tala). 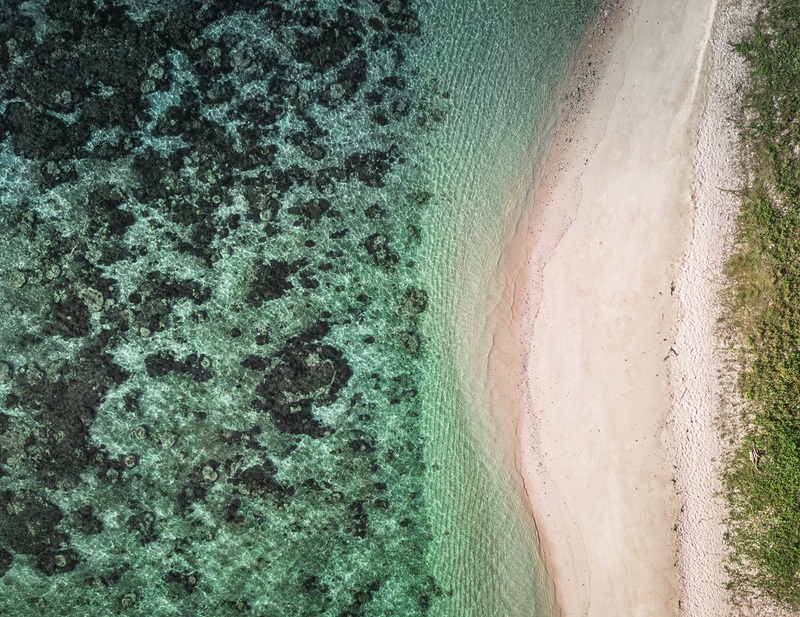 A gradual decline down to sea level ended in Satuiatua. We wish we had more time here. 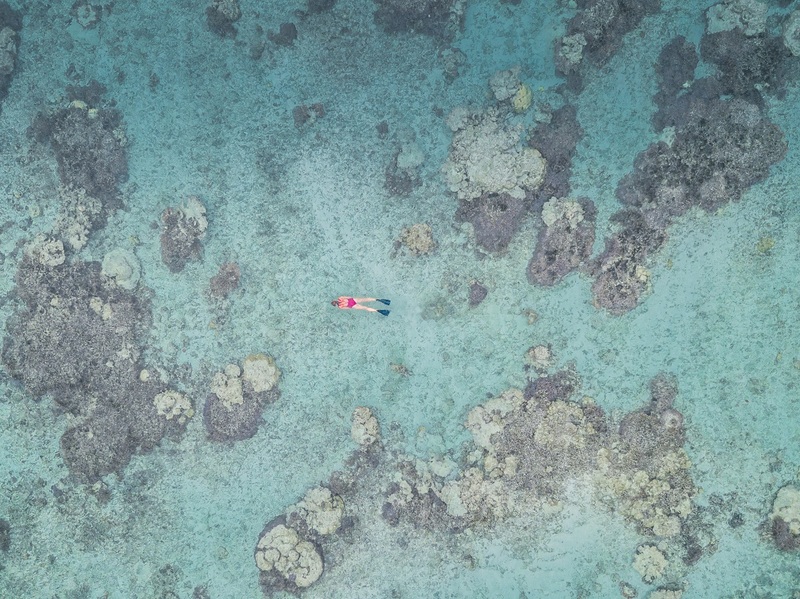 With large fales and excellent food, this also was the best snorkeling spot in all of Samoa. The finish to the ride was mostly flat making for an easy ride. 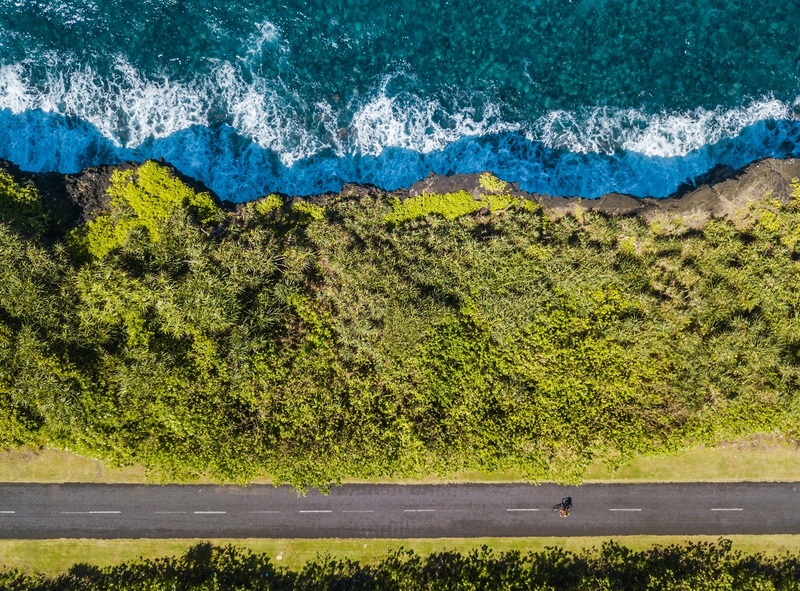 There were a few nice scenic coastal areas as well as two major stops at the Alofa’aga Blowholes (5 Tala) and the Afu Aau Waterfall (5 Tala). 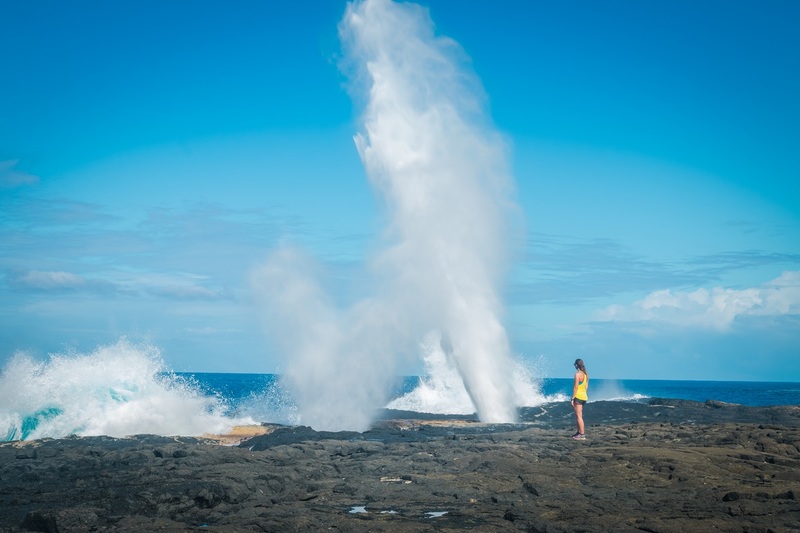 The blowholes were some of the most powerful we have ever seen, and normally there is only one. There were at least 10 blowholes. The waterfall was nice, but did not blow us away. The best part about it was cooling off in the fresh water. We finished in town, which was a disappointment as the food was horrible but the options are limited. Stay: There are several budget motels in town with rooms starting from 80 Tala or Janes (???) Lagoon Bungalows for 120 Tala with breakfast. Salelologa wharf, ferry ride and then from Mulafinua wharf to Outdoor Samoa. A short day to get to the wharf to catch the ferry to Upolu. A quick ride from Mulafinua back to Outdoor Samoa completed our journey. Buses are typically available every 30-45 minutes back to Apia. Hydro Flask water bottle – We had 2 water bottles per person. Outdoor Samoa provides small water bottles (x2) with the rental. Sunglasses – My favorite Ray Ban folding Wayfarer glasses. If you are considering buying any camping gear, hiking gear, or photography gear, please consider buying through the below affiliate links on this page. You won’t pay for anything extra at all, but we will receive a small commission (usually 2%-5%) to help run the website. We appreciate the support! The only ATM in Savaii is in Salelologa. Make sure to bring enough cash for the entire stay. 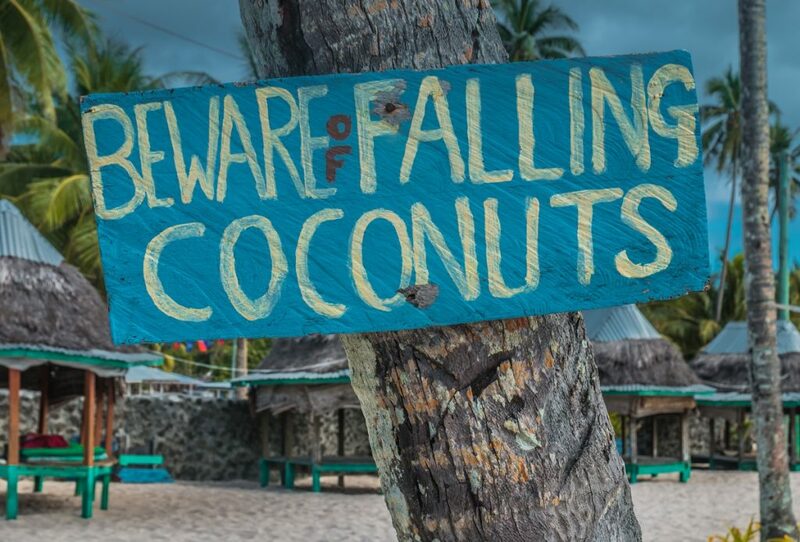 Several beach fales and resorts do take credit cards for a 3.5% fee. Bike early in the morning to avoid the heat. Try to start each morning no later than 8am. The Panniers are waterproof but the handlebar bag is not. Bring waterproof bags or dry bags for valuables and camera equipment. Ziplock bags are good for money and phones as well. Dogs are not as aggressive as in Upolu, however, there were a few dogs who aggressively came after us on the bikes. If this happens, stop pedaling (they don’t like your moving feet), raise your hand as if throwing a rock (but don’t ever actually throw one) and yell Aloo (go away). That should always work. Reserving fales ahead is not necessary, even during the busiest tourist season in July. Most fales were empty. The only exception might be the Falealupo Beach Fales on weekends, which there were are only 5 fales. Prices were cheaper and negotiable on arrival compared to booking ahead as well. Sunday in Samoa is Church and family day. It is also tradition to cook Umu. This is a perfect day for an off day to enjoy a free lunch. We planned our trip to have our Sunday as an off day in Manase where some fales offer a free lunch Umu in addition to the breakfast and dinner. Female bikers should all have a lavalava. While it is uncomfortable to wear while riding, keep it close by and wear it when in villages when not riding the bike. Always wear the lavalava on Sundays if outside of the beach fales. Theft is not common but has occurred. Make sure to lock your bikes each night and keep your belongs locked up in your fale or with management.